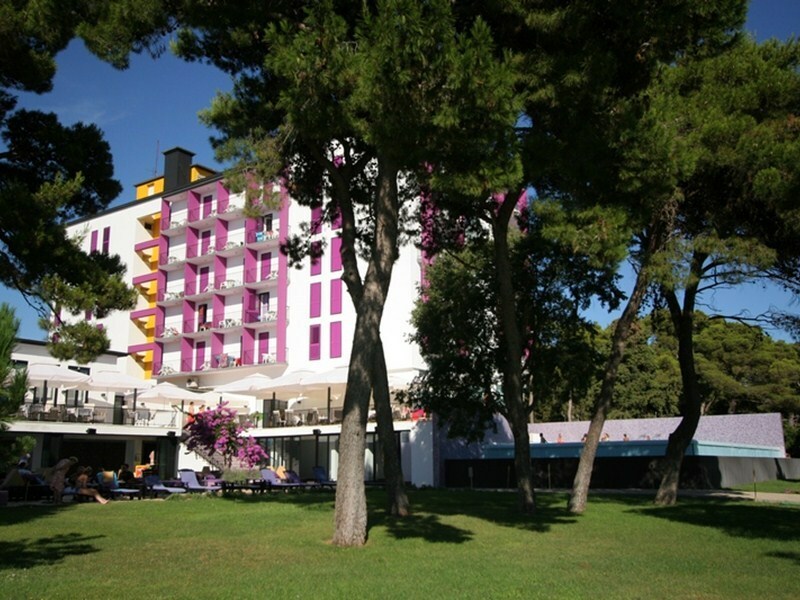 Hotel Adriatic, Biograd na moru is located near the shore and surrounded by pine trees, with a variety of different services make hotel Adriatic an ideal place for relaxing and enjoying yourself during the summer vacations in Dalmatia, Croatia. Modernly designed and equipped, this three star hotel`s exterior was made to resemble lavender, a plant with healing properties. Its doors are open to tourists and visitors from April till October, who can stay in one of 100 rooms the hotel has to offer. As it`s a hotel for all kinds of guests, single people, couples and whole families, its rooms are also different sizes, for the better accommodation of guests. Pets are also allowed in the hotel, so you won`t have to worry where to leave your cat or dog while you`re on your vacation. Adriatic hotel has it`s own parking lot, where if you pay a fee, will always be a parking spot with your name on it, while you`re staying at the hotel. Inside the lobby there`s a free WiFi hotspot where you can surf the web on your laptop, tablet or smartphone, while inside your room it costs a fee to use the WiFi. Every part of the hotel is air conditioned, regularly cleaned and maintained, including the rooms, which have one or two beds in them. The rooms are regularly cleaned, nicely decorated, and equipped with top-of-the-line bathroom, minibar, air conditioning and a huge flat screen TV. Room service is available to you at all times, and every day, housekeeping will come and clean your room unless they`re instructed otherwise. For a small fee, they can even wash, dry and iron your clothes. Breakfast lasts from 7 till 10am, while dinner is served from 19 to 21:30pm. Adriatic hotel has its own pool bar where you can cool yourself with a nice cool drink while swimming in a fresh water pool. Also, as part of the hotel, there`s a cocktail bed bar named Lavender, where you can relax and sprawl on a soft bed while enjoying your cocktail. There are gravel and concrete beaches around the hotel, complete with easy chairs, parasols, showers and beach bars, everything you need to have a good time and enjoy yourself.